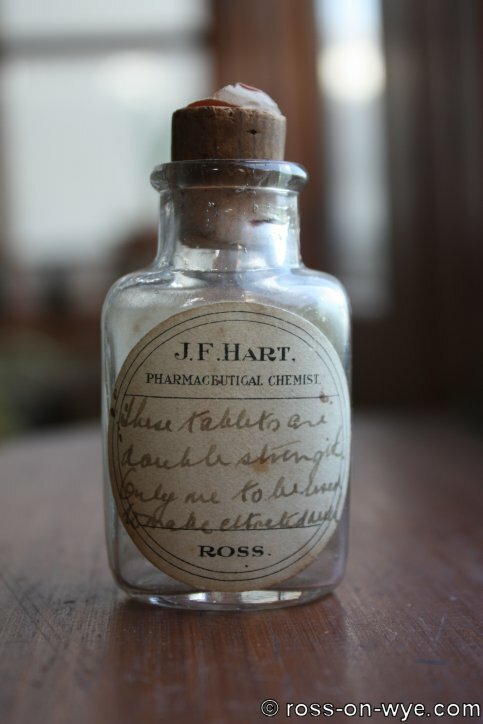 The final chemists business in Man of Ross House was J.F.Hart in the 1930s (so far the earliest reference is 1936) when Harts took over from Thomas Matthews. Barry R. Butler M.P.S. 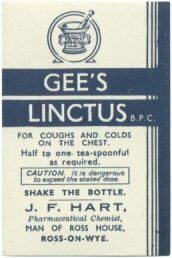 had taken over the chemists by 1981 and continued using the "Harts Chemists" name. By 1999 the Chemists has closed and Man of Ross Gallery was using the shop as a exhibition room. The following are some examples of J. F. Hart labels. For INSECT BITES. A Cure and a Preventive. DIRECTIONS- Apply a small quantity to the part affected. The following are some examples of J. F. Hart bottles.